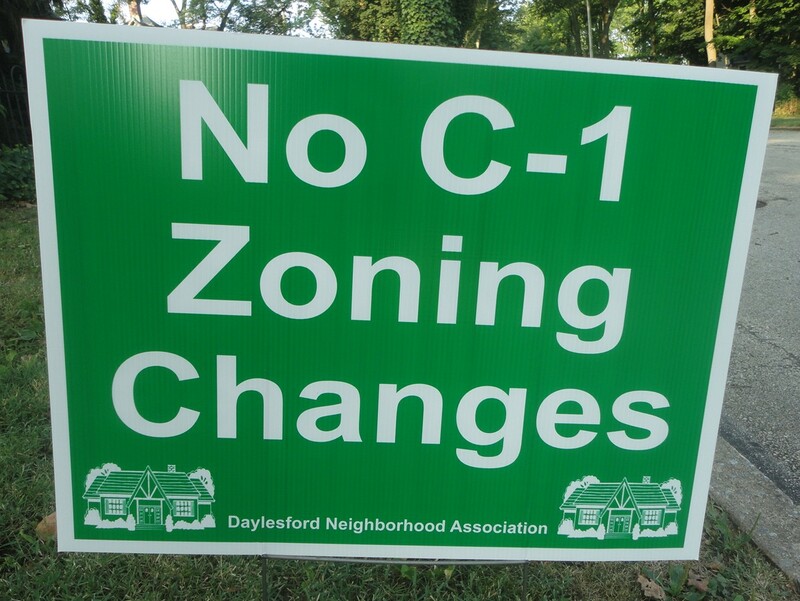 Tredyffrin’s Proposed C1 Zoning Amendment Change … Where do we go from here? Residents from the Daylesford neighborhood made their opinions known at last night’s Planning Commission meeting. With the exception of one person, all others in the Daylesford community spoke against the proposed C1 zoning ordinance change and the assisted living facility plan for the old Jimmy Duffy catering site. A couple of things were striking about the comments from Larkin and other Daylesford community members … R.E.S.P.E.C.T. I have attended many Planning Commission meetings and often neighbors become very vocal in their opinions, and at times disrespectful to the planning commissioners, staff and/or applicants. Not so last night. A steady stream of residents offered their positions on the proposed C1 zoning change; their comments delivered with the utmost respect. Although the vast majority of residents were either opposed to changing the C1 zoning to permit an assisted living use and/or asked for additional restrictions to be added to the zoning change, those choosing to comment did so with respect for the developer, his attorney, township staff and Planning Commissioners. The other striking theme to the discussion on the proposed assisted living project was the process itself. The planning commissioners acknowledged that they have been working on this project with the developer Ed Morris of Berwyn Real Estate and Gerald Farrell of Capital Health Service, for over 2 years. Yet the residents most-effected by the proposed assisted living facility only found out about in January of this year. By the time the Daylesford Neighborhood Association were aware of the proposed C1 zoning change, Morris and Farrell along with their attorney Denise Yarnoff, had attended several Planning Commission meetings. Morris openly declared at these public meetings that there was no opposition to the project from the neighbors. Resident after resident pointed out, they could not support (or oppose as is the case) a project that they knew nothing about. Unfortunately for Mr. Morris, he misspoke when he portrayed the neighbors supported this project … as evidenced last night, nothing could be further from the truth. “What is the difference between an Assisted Living Residence (ALR) and a Personal Care Home (PCH)? ALRs are different from PCHs in 3 ways: concept, construction and level of care. ALRs embody the concept of allowing a resident to “age in place” without having to move to a licensed long-term care facility when their needs increase. The construction of an ALR is different from a PCH. PCH residents live in bedrooms that may be shared by up to 4 people. ALR residents will have living units with kitchen capacity. No one will be forced to share a living unit. Living units will have a door with a lock and a private bathroom. This housing-service model will allow for privacy and maximum independence. It is similar to a studio apartment where the resident can make meals if desired and have a private bathroom. Even on its face, the ordinance amendment makes no distinction about which purpose the property intends – stating only that it will follow the applicable state statutes. No statute is identified … I’m not a real estate lawyer, but with this lack of specifics, this amendment seems to broadly define a use. Likewise, unless “arterial street” is a defined term in our zoning codes, then any C1 property would be free to build any quality or size of facility. I’m not suggesting that is what is intended, but when we write laws/rules/ordinances/amendments, I think a bit more clarity would be prudent. In my opinion, Ed Morris’ contemplated development of the old Duffy’s Catering site is dead in the water for several reasons. 1 – And this is a preliminary point that focuses on the general lack of process and procedure around this particular plan. 2 – Which builds on point 1 above, this is effectively become a spot zoning/contract zoning issue. 3 – The pre-existing non-conforming use of the R1 parcel for parking to support the C1 use has lapsed – which itself is a fatal blow to the project. On one hand, the PC wants to see the site is used. On the other hand, the PC wants to be comfortable with the use. In last night’s proceedings, it was far from clear how the PC and the BOS could let things get this far. Trish Larkin’s presentation (which by the way I was happy and honored to have input on) made crystal clear how problematic the situation is. What was clear from last night’s meeting was that the PC was giving great weight to the developer, their time, money spent, and almost no consideration to impacts of the zoning change or the needs and concerns of the citizens. To suggest that a “Super Wawa” could go there is a false choice. First, that is a use of right. Second, it is an entirely inappropriate comment to make by Ed Sweeney. The absurdity here is that a legal use is being subordinated to a non-permitted use. Again, it is entirely inappropriate for the PC to consider the money spent by a developer – unless of course – this is really a contract. The stated reasons in previous paragraph outline a process that is unreasonable and arbitrary. It is unreasonable to the extent the way the needs of the developer appear to be the only areas of concern. There is little to no consideration of the broader zoning impacts. The only consideration appears to be for this developer, this project and this parcel of land. The arbitrariness goes to the general lack of process. The extent of un-reasonableness and arbitrariness are direct factors that go to determine if spot zoning is in fact, present. One can argue that in reality, there is a contract here – which gives rise to a contract-zoning case. The conclusion in Mr. Donahue’s opinion is that the zoning officer “Could not reasonably conclude that the use has lapsed.” In fact, I just gave a number of reasons why Matt Baumann, our zoning officer, could reasonably conclude that the use did lapse. In fact – I’d say that based on these facts – Baumann couldn’t reasonably conclude the use didn’t lapse. If the township tries to grandfather this use, that itself could be a prima facie case of contract zoning – which is always construed to be spot zoning. Ironically, where the PC and at least some on the BOS thought they were helping this project along, they actually did more to harm it by not following sound process and procedure. By the end of the evening, it became apparent to the Planning Commissioners that there were too many unanswered questions surrounding the C-1 zoning ordinance change for them to feel comfortable taking a vote to move the proposal forward to the Board of Supervisors. The applicant’s attorney agreed to add restrictions to the proposed text amendment and re-submit at the August Planning Commission. In the meantime, the township staff will work on finding answers to the questions asked by the Planning Commissioners and residents, including a review of other municipal zoning ordinances that govern assisted living facilities. Thank you to the Members of the PC, along with the many Tredyffrin residents, and DNA members that participated in a respectful and thoughtful dialogue about the proposed C1 Ordinance Amendment. DNA members articulated their concerns that the Township could set major negative precedence for changing ALL of the Township’s C1 zoning for this ONE developer, for this ONE project, on this ONE space. We fully agree with Mr. Lukens that as our population ages, we shouldn’t have to leave Tredyffrin in order to find a suitable Assisted Living Facility. However, we respectfully request that the PC give a comprehensive analysis as to why Assisted Living use in C1 is a good idea. The goal should be to have consistent and compatible uses that meet the needs of ALL residents. If the PC recommends that Assisted Living use should be added somewhere OTHER than in the Institutional Overlay districts – ONE THING CLEAR – Tredyffrin has ONE shot to “get it right“. The DNA was thrilled and grateful to the Planning Commission for delaying the vote last night and opposing the Ordinance Amendment with no restrictions. We appreciated that the Applicant was asked to “go back to the drawing board” and place conditional uses/special exceptions/regulations. Rushing this decision comes with a high cost, and careful deliberation is required. As it stands, the Supervisors delayed the Public Hearing until the September 17 meeting. The PC has a daunting task to exhaust all possible options by that deadline. So … what’s next in this process? Where do we go from here? Further discussion of the proposed C1 zoning ordinance change is scheduled for the August 16 Planning Commission meeting. It is anticipated that the developer and his attorney will present an updated version of the zoning ordinance change; hopefully it will include additional regulations and requirements. We learned this week that the supervisors moved the public hearing on the proposed C1 zoning ordinance change from their August BOS meeting to their September 17 meeting. Has the Daylesford neighborhood association offered any suggestions as to what they would like to replace Jimmy Duffy’s or what sort of use would be agreeable to them? Not suggesting a false choice, or agreeing with an either or approach. Was simply curious if the neighbors had an opinion or preference of what would go into that vacant site. Since the neighborhood group must meet or communicate somehow, I was curious to learn if any of them had suggestion or preferences for use. Your timing is spot on, Mitch. A subset of the DNA has met up a few times this week to discuss other options for the site. Even though (as John points out) the DNA isn’t obligated to come up with Plan B, we truly want to help be “part of a solution”. Therefore, we are actively reaching out to local commercial agents and developers that may have a viable C-1 business opportunity for the Duffy space. If you (or your network) knows of anyone looking for a C-1 space, we’d love to talk with them!! We will report our findings at the August 16th Planning Commission meeting. Thank you! There are a lot of informed people on the process that read this blog. Can someone please advise us on whether this project could have gone through traditional zoning hearings to be built? Why did this applicant pursue an ordinance amendment to the zoning code if the only parcel in play is the Duffy parcel? Thank you for this answer John. If there was an approach that would have specifically addressed THIS parcel, then the “global” approach of an OA is even more suspect. As to what the DNA would agree to, I would suggest they consider a proactive approach with the property owner and help to,identify what kind of project would generate support. They don’t need to, but the slide about a pocket park reduced their credibility (IMHO) as to the charge of NIMBY. Being a good neighbor ultimately will require a two-way relationship. Clearly this prospective owner ignored that step while creating the impression that he had done his work. WHAT is the legal notice required inTredyfrin? 500 feet? certified delivery? Can property owners sign up to be on a notice list for particular parcel? Sorry to burden you John, but you seem to flourish in the role of expert. Thanks. Thanks. I asked about notice because one of the concerns was why this had advanced through several meetings before the DNA knew about it. If every lot within 150 feet would have been advised, that might be a small net. If it becomes sufficient to have notice on the internet, then people will need to register with Google notifications or whatever to get told every time something with the relevant terms shows up. All good info. And Trisha — you are clearly working hard and well on behalf of your community. I’m not giving advice to give in — just to move forward. Thanks. John: Can’t thank you enough for all of your research! The DNA appreciates you weighing in and providing some sound arguments for ALL of us to consider. We hope that Township officials are reading your comments and seriously considering what you’re bringing to light. We look forward to seeing what transpires over the next few weeks. Township Reader: You’ve also make some great points. Several DNA members (& non-Daylesford residents that live in Tredyffrin) have contacted me since the PC meeting. Several ideas have been floated and we’re meeting this week for a brainstorming session. It’s amazing to meet so many new Tredyffrin residents that are willing to share best practices and help find solutions. This is what TRULY makes living in Tredyffrin so great!! No matter what ultimately happens with this project – we’ve been lucky to meet some really brilliant people that have a passion for helping! The DNA agrees with you that a two-way street of communication is the first step to building a working relationship. Hopefully we’re on our way to making that happen. As always, thanks for your comments. Maybe someone can suggest the Waterloo Gardens property now that it’s vacant. Sure, that’s not in this neighborhood…just someone else’s. So as the baby boomers reach an older age in exponential fashion, there will need to be 10 times the amount of nursing homes and retirement homes there are now. Where shall we put them? Mars? The benefit of Waterloo Gardens is it is already commercial property and may not need the same level of adjustments needed. Waterloo Gardens is already a commercial property? So was/is Duffy’s, the office park and the Vet hospitalall on that corner. Waterloo Gardens may not need same level of adjustments? If Zoning, I can’t answer; if re-building, I would think same if not more. My point was sarcastic. There are many homes and a neighborhood around Waterloo Gardens, too. But it seems like it’s ok to put it there. That’s NIMBYism at its core and a lot of this argument reeks of that. I agree we shouldn’t give away the farm on a zoning change that could be township-wide and applaud Pattye for bringing that issue to the forefront. But so much else I read from the Daylesford Neighbors is NIMBYism and accusation against the BOS who AREN’T EVEN HEARING THIS ISSUE NOW. And remember, so many of the people complaining about the PC now are the same ones who complained about their power being over-ridden in the St. Davids Golf Club situation. Didn’t say Waterloo wasn’t in Easttown – was just picking up earlier comment as an example. That is my only point about NIMBYism. I applaud the DNA for standing up for their community and agree that we shouldn’t have a twp-wide zoning change unless it fits into a broader plan. But, many of the other arguments/suggestions (like, just put in another neighborhood) are not reasonable or productive, they are NIMBY. I’m a 49 year resident and have to ask : Is there any way to prevent corruption-centered individuals from being appointed to these Commissions ? I live in Radnor now, which is currently considering changes to the Home Charter, but it appears quite difficult to screen the greedy from government ! I don’t know about Radnor, but I can say that your characterization of the Tredyffrin Planning Commission could not be more removed from reality. While I understand the frustration you feel when neighbors behave with NIMBY motives, I think we miss the point and the purpose of planning and zoning. It’s politically driven, and only political decisions can either overturn or redirect any PC outcome. NIMBY is a perfectly reasonable position to take when a developer is looking for a variance. After all, these people own property and cannot do whatever they choose. They purchased property with an expectation of what could be done with that property. It IS their back yard, and they cannot stop any variance except by making their case about the character of their community…and hope the PC agrees, or that the BOS will. I have suggested here that they would be well served by coming to some kind of community consensus about what kinds of projects they could accept if possible, so they can have a relationship with any prospective developer. Something is coming there, and the possible options are not necessarily preferable. A developer of storage units was at the meeting and commented that he could only put 50+ units there and the price was not economically feasible. So if the price drops (which it will if the property sits dormant and any development costs too much to go forward), a less desirable option may well surface. No, it will not be a Super WAWA. But recognizing that it’s always their backyard, they certainly SHOULD have a stake in a prospective development. I understand the process is not functioning correctly, and I have long been concerned that this is just the canary in the cave….get it passed here by amendment and then stand back and see which parcel was REALLY the intended target. And I also understand that if it’s a by-right use, the neighbors have nothing to stop it. Which is why I have advocated that they get active in trying to influence the outcome for that parcel before it’s completley out of their hands. Question: there is a large office building just west of the Vet Center that shows as available. The office building sitting on the corner of the parcel, adjacent to the Duffy building, is that in play? It is the applicant’s lawyer’s former office building. Who owns that? In trying to give Mimi the benefit of the doubt, I have speculated that she is eager to turn dead sites into sites that add to the tax base. In the past few years, she has doubtlessly faced untenable budget decisions with a BOS that doesn’t ever want to raise taxes, but a declining tax base and no significant interim or transfer taxes to bolster the bottom line. So if she got a little eager to get this property underway, it may not be for someone else’s glory. But sadly I agree that this whole process is so complicated that it makes no sense. The enthusiasm for the project with this corrupted process simply is not aligned with this site. It’s not big enough, the developer is not powerful enough, and the result is not lucrative enough. I do not have an issue with the PC wanting to cooperate with a developer to get a dead parcel back to life, but the bang here just isn’t big enough for the bucks expended. One can only hope that as the BOS/PC absorb Chester County PC’s recommendations, the light bulb goes off! It’s crystal clear they agree C-1 is NOT the place for assisted living. Period. End of discussion. Not even if restrictions are attached. It doesn’t belong in C-1. It belongs in R2, R3, R4 or Institutional Overlay (according to Chesco PC). Seriously, how many more inconsistencies can the County PC illustrate? Guess we will see what happens next week at the PC meeting. Fingers crossed that they’ll side with the County. Completely agree with TrishaLarkin C-1 is NOT the place for assisted living, Not even if restrictions are attached. I just wanted to know What discussion you get in meeting you have arranged before couple of weeks?